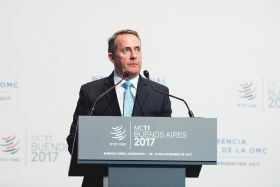 The government has unveiled a plan to encourage more British companies to export after Brexit in a bid to make the UK “a 21st-century exporting superpower”. The plan to increase UK exports to 35 per cent of GDP comes as the government works on individual sector deals for a range of industries, including food and drinks. These form part of an Industrial Strategy to boost jobs and growth in areas where the UK has a competitive edge in terms of trade. Last year UK exports reached a record high, with £620 billion of goods and services exported by British companies, accounting for 30 per cent of the UK’s GDP. Now the Department for International Trade wants to increase this figure to 35 per cent, estimating that 400,000 businesses believe they could export but don’t. In a speech to business leaders on 21 August the international trade secretary Liam Fox said “the UK has the potential to be a 21st-century exporting superpower” by incentivising more companies to sent their goods and services abroad. “As we leave the EU, we must set our sights high,” he added. The government plans to target potential exporters with better loans, guarantees and support, including support for businesses looking to invest overseas and an online tool to allow businesses to inform government of the non-tariff barriers they face. Responding to the new export strategy, Ian Wright, chief executive of the Food and Drink Federation, said he would welcome extra support for the sector as he negotiates a sector deal for food and drink manufacturing with the government. “Food and drink is a UK exports success story, with global sales reaching a record level of £10.6bn for the first half of 2018,” he said. “Yet the majority of UK food and drink businesses still do not export and, as a country, we export less food and drink than some of our key competitors. He added: “Proposals to boost food and drink exports form a key part of the Industrial Strategy sector deal for food and drink manufacturing, which we are currently negotiating with government.